In the frenzy of creating concepts to an agency deadline, invariably someone will propose a ‘Zen’ execution. Usually this can be attributed to a free-floating miasma of stress, or too much coffee. It is a knee-jerk idea that you see all too often. This Zen territory (as I call it) has little to do with the school of Mahayana Buddhism, developed in China which spread to Korea, Vietnam and Japan. Instead Zen territory is a comforting vision of meditative, lotus-positioned calm. Marketing is of course not interested in any of this. It is, however, interested in images of tranquility. A perennial stock shot favourite is of someone meditating on a rock before a empty horizon. 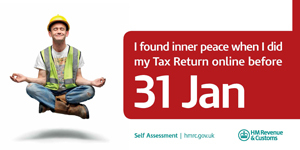 As weasel creatives, our task is to introduce the reason for this tranquillity, even a spot of yogic flying, that comes from completing a tax return before the deadline… As in this example from 2013. Of course doing tax returns can trigger all kinds of negative emotions, such as fury, fear and a whimpering dark night of the soul. Images of inner peace can therefore be useful when there is something to be nervous about. Flying often makes me particularly nervous, so when I worked with Air France I could see the wisdom in their brand’s insistence on always showing cloudless blue skies, which seem to promise that on an Air France flight turbulence was improbable at best. 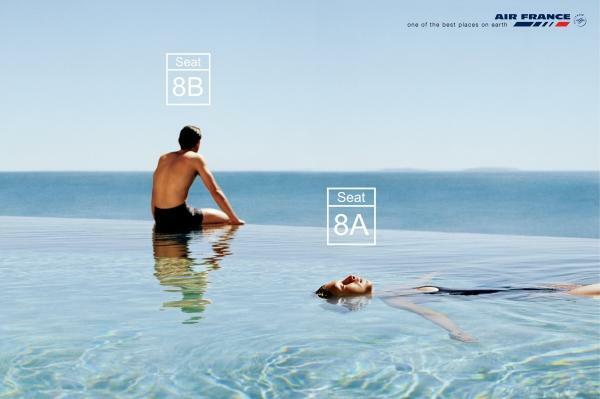 Air France’s creative work derives from the insight that the journey should be an enjoyable part of your trip, not an endurance test. So their executions show people in a reassuringly relaxed frame of mind, such as the example below, full of the dream-like tranquility of first class travel. Such images show a post-consumer moment, where the characters need nothing other than to be left to their cross-legged enlightenment, with all the pain of making a difficult purchase behind them. Ah, relax now. Shoulders down. Can’t you just feel the bliss that comes from spending money? This entry was posted in Airline, Marketing, Zen and tagged advertising, Air France, HMRC, Immodium, Zen. Bookmark the permalink.